The most PRECIOUS thing we have, the only currency that counts. Our true wealth is measured by how we savour each moment. Experience the riches of Time Diamonds. TREAT YOURSELF to a weekend immersion of making time - for yourself, for connecting with nature, for replenishing through ritual, art, play and movement. 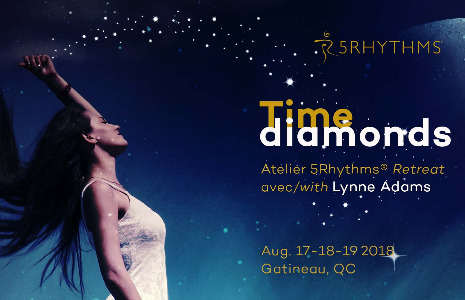 The 5Rhythms guide us as we let the daily grind slip away and expand into different definitions of time. GROUNDING ourselves in a woodland setting we RECONNECT to our Selves and dive into the deep beauty of our lives. A jewel in the Gatineau hills, Gaia Wellness Retreat will embrace us in this exploration. In the midst of tall forests and abundant wildlife, it offers fresh vegetarian meals, a wood-fire sauna and a pristine lake. Lodging is in shared modern wood cabins. We'll move in a cozy dance space, a bonfire meadow, a grassy amphitheatre, a sandy beach and on forest paths, all the while mining for those Time Diamonds. No previous dance experience needed, just lots of curiosity and a willingness to explore what it is to be an embodied humane being. Arrival on Friday as of 4pm. Ends on Sunday at 4pm. Full refund minus a $25 admin charge till July 15th. No refunds after July 15th unless a replacement participant is found. If replacement is found a $45 admin charge applies to the cancelled registration.